Comments: Born across the James River in Buckingham County, Virginia, Dr. Luther R. Stinson graduated from the University of Virginia Medical School around 1900. He set up his practice in Scottsville, and wishing to succeed, Dr. Stinson asked Sam Gault, Scottsville's postmaster, "Sam, how can I show'em I'm a good doctor? It's not easy getting started." Sam pondered. "Buy a horse and saddle," he advised, "and ride out of town lickety-split, stay awhile, and come back. Then a little later ride out on another road, lickety-split, stay awhile, and come back. Then lickety-split again---." The doctor, runs the story, bought a saddle and borrowed a horse. 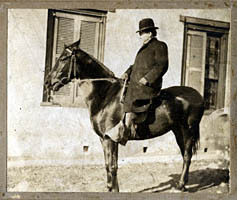 Shown at right is Dr. Stinson on horseback beside the old Apothecary Shop (Lot 152) at the north corner of Lindsay and Valley Streets in Scottsville. 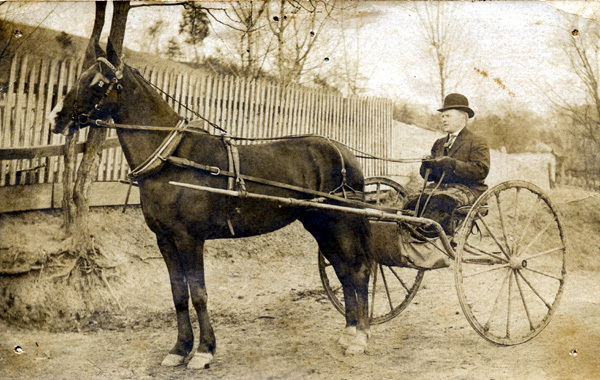 By 1908, judging from the top photo, it's possible that a saddle-weary Dr. Stinson preferred using a horse and sulky to attend to his patients. In 1910, Dr. Stinson switched to a new bright-red Maxwell to keep up with his successful practice.